Reaching a younger audience can be tough. Research shows that 40% of teens in New Zealand use five or more social media tools alone, and that’s before we even consider other media channels! In an environment awash with advertising, it can be difficult to stand out amongst the clutter and engage with the youth audience effectively – especially when it comes to behaviour change. Whilst smoking in young adults has dropped by 20% since 2007, there are still misconceptions around the cost of even just a few cigarettes can have on your health, appearance and wallet. Educating the youth audience on the effects of smoking has been one of the key messages for Smokefree’s Stop Before You Start campaign, with the main key message being “Social Smoking Leads to Regular Smoking”. 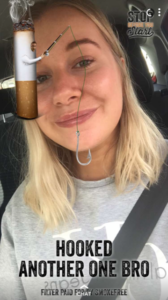 Within a multi-channel approach, Snapchat advertising was used to highlight the reality smoking can have on your life. Using four different creative executions for the geo-filters, we saw over 100,000 engagements in 2018 from the target audience. The cost per engagement was also the lowest across all media channels, providing great ROI for the client. Watch the GSLP team in action below!